Empyema is the presence of purulent material in the pleural cavity, and it is a well-known and frequent complication of pneumonia in children. Despite the new antimicrobial treatment options and the different drainage techniques, parapneumonic pleural empyema still represents a significant cause of morbidity and mortality. Streptococcus pyogenes is an infrequent cause of empyema. In this article, we will present a four-teen years old girl with empyema who presented with severe additional clinical symptoms including hypotension and hypoxia. Streptokinase is five times table fibrinolytic therapy improved after implementation of broad-spectrum antibiotics, has been used up to six weeks. We wanted to present this case because of the challenges that we faced in the management of the disease. Pleural empyema is a purulent fluid presence in the pleural space and is a known and frequently encountered complication of pneumonia in children. In 40-50% of patients hospitalized with acute bacterial pneumonia, parapneumonic effusion is known to develop (1). Approximately 10% of these patients are in the complicated clinical table and effective drainage is required for resolution (2). Pleural empyemas lead to high rate of morbidity and mortality although antimicrobial treatment opportunities and pleural space drainage space choices are on the increase (3). Streptococcus pneumonia, widely encountered sample of culture-positive pleural empyema, is known to be dependent on Staphylococcus aureus and Haemophilus influenza. Streptococcus pyogenes is another microorganism mostly giving rise to upper respiratory infections, however, rarely leading to pleural empyema. A 14 year-old female case was presented in this study in which Streptococcus pyogenes was determined to be an agent and followed in a difficult table that could cause hypotension and hypoxia. A 14 year-old girl referred to hospital with weakness, loss of appetite, fever, difficulty in breathing and cough complaints that were going on for 10 days. It was stated that the patient had used an antibiotic for 7 days due to her upper respiratory tract infection two weeks ago. No characteristic was identified in the personal background and family history of the case. In her physical examination; cardiac pulse: 108/min, respiratory rate: 40/min, oxygen saturation: 92%, blood pressure: 80/60 mmHg, weight: 50 kg (25-50 p), height: 160 cm, overall situation: mean, weak and dehydrated, conscious; dyspnea and tachypnea were present, oropharynx was hyperemic, mobile lymphadenopathy sized 1x1 cm was present in the right cervical. In the pulmonary auscultation, respiratory sounds reduced significantly in the right hemithorax and tuber was heard as murmur in the right hemithorax again. No pathological findings were identified in the other system examinations. In the laboratory analyses; in the memogram; leucocyte: 36,100/mm3 (85% neutrophile, 10% banded neutrophil, 5% lymphocyte), hemoglobin: 11.8 g/dL, hematocrit: 33%, mean corpuscular volume: 83 fL, thrombocyte: 381.000/mm3, C-reactive protein (CRP): 288 mg/L (0-6 mg/L), sedimentation: 80 mm/hour. In the blood biochemistry; sodium: 131 mmol/L, potassium: 5.5 mmmol/L, total protein: 6.9 g/dL, albumin: 2.9 g/dL, in the artery blood gas pH: 7.50, pCO2 25 mmHg, pO2 57 mmHg, HCO3 22 mmol/L, BEB: -3, SaO2 91. 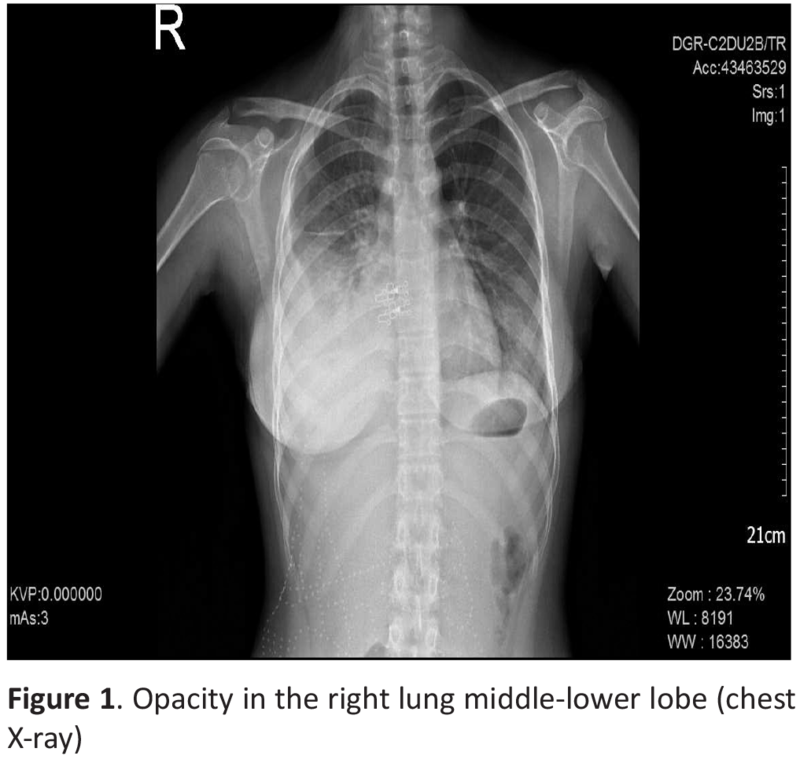 In the PA lung graphy, diffuse opasity was observed in the medium and lower lobes of right lung (Figure 1). The patient was pre-diagnosed with pleural effusion secondary to pneumonia with anamnesis, examination and lung graphy findings; thoracentesis was performed after thorax computed tomography (CT) had been taken. The fluid obtained in thoracentesis appeared as liquid purulent. In the microscopic examination, massive leukocytes and gram (+) chains of cocci were seen. 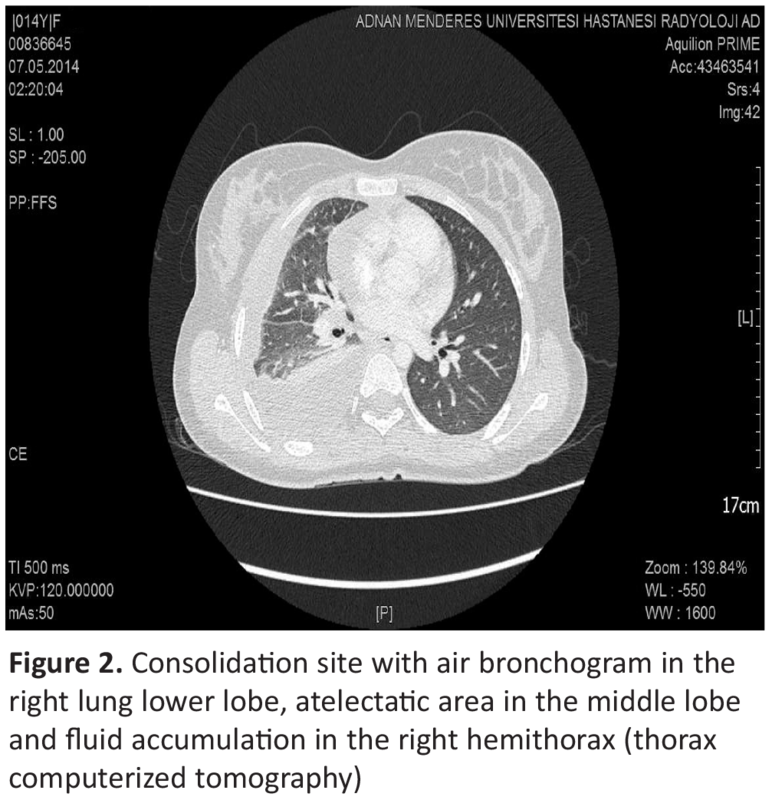 In the thorax CT examination of the patient, however, free fluid accumulation was determined in consolidation area involving air bronchogram in lower lobe of right lung and amid pleural leaves in the right hemithorax and atelectatic area in the right medium lobe (Figure 2). In the pleural fluid culture conducted, group A beta hemolytic Streptococcus (AGBHS, Streptococcus pyogenes) multiplied. No reproduction was seen in the sputum culture, ASO value 288 IU/mL was found high (normal; 0-200). Mycobacterium tuberculosis could not be identified in the pleural fluid direct examination and culture. The patient was initiated oxygen with nasal cannula, IV fluid due to hypotension and dopamin 5 mcg/kg/day. Owing to her empyema and pneumonia, dual antibiotic treatment was commenced including ceftriaxone 100 mg/kg/day as 2 dose intravenous application and vancomycin 40 mg/kg/day as 4 isodose by intravenous infusion. Thoracostomy tube was affixed to right hemithorax of the case, 450 mL purulent, exudative fluid was drained, in the yellow-purulent material; leukocyte count 21,500/mm3 (90% polymorphonuclear leukocyte), glucose 6 mg/dL, protein 3220 mg/dL and pH was determined as 7.11. 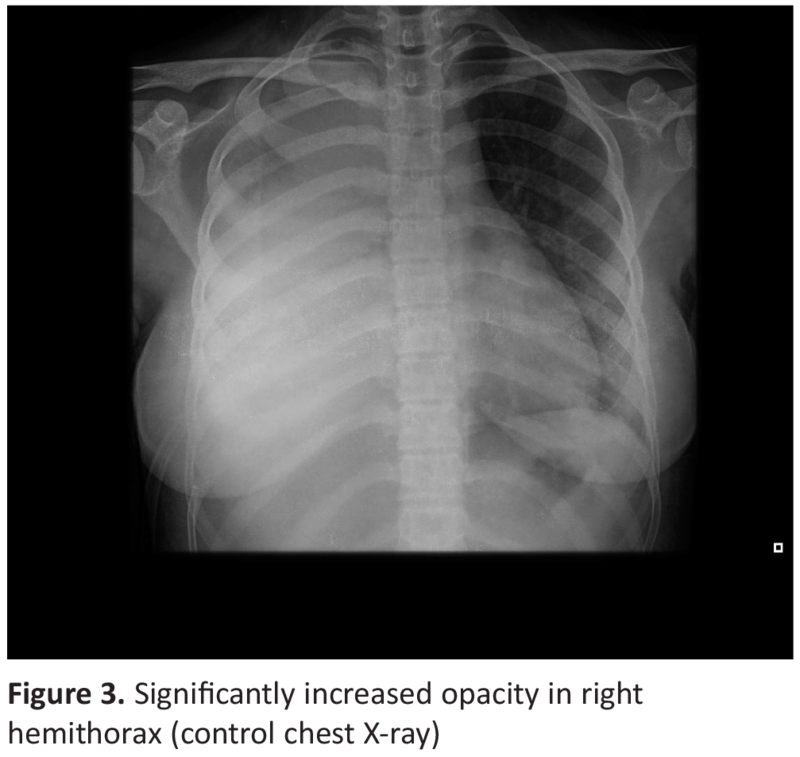 On the 3rd day of the treatment, the control lung graphy of the case whose respiratory complication and high fever were continuing was taken and it was seen that opacity significantly increased in her right hemithorax (Figure 3). The patient was evaluated by a pediatric surgeon and fibrinolytic treatment was recommended. 250.000 U streptokinase from thorax tube was applied in 100 mL serum physiologic as one dose. This application was repeated every two days and five times, approximately 100 mL purulent hemorrhagic fluid was attained after every application. The antibiotic treatment of the case was discontinued by completing the treatment 4 weeks after her clinical findings and lung graphy ameliorated and she was discharged provided that she would come for the polyclinic control. Written and oral consent was acquired from the patient and her mother in terms of the study. Streptococcus is an immobile, asporous and gram-positive cocci shaped bacterium. Streptococcus types differ from each other in terms of hemolysis that they form in blood agar within themselves. If there is a hemolysis in the form of transparent zone around the colony in blood agar, it is called as beta; if there is a partial hemolysis with the greenish zone, it is called as alpha and if there is no hemolysis, it is named as nonhemolytic. Beta-hemolytic Streptococcus types are those responsible for most significant clinical tables in humans and this group is divided into more than 20 serogroups (A,B,C etc.) compared to C antigen on the cell wall. Among them, group A (GABHS) (S. pyogenes) is most commonly type composing infection in humans. They most frequently lead to clinical tables such as; pharyngitis, tonsillitis, red skin and soft tissue infections (impetigo, ecthyma, erysipelas), streptococcal toxic shock syndrome and rarely cause pneumonia, empyema, endocarditis, pericarditis, omphalitis, cellulitis and myositis. Empyema caused by Streptoccus pyones is rarely seen, on the other hand, it proceeds quite seriously. The bacterium creates an infection in the upper airways and then in the lung through airway and gives rise to empyema (4). Although S. pneumonia, S. aureus and H. influenza are most commonly encountered in the empyema etiology, group A Streptococcus types, gram-negative organisms, tuberculosis, fungi and malignancy are other rarely determined causes. In a study conducted by Celayir et al. (5), S. pyogenes was identified in only one out of 47 cases with empyema. GABHS could not be produced in 21 out of 85 cases with empyema that reproduction was determined in a study performed by Ertuğrul et al. (6). In a study published in 2014 by Sakran et al. (7), reproduction was identified in 32% of children with pleural empyema in 17-years of research, GABHS positivity remained at 1%. In another study where 602 cases were analyzed from all ages, however, GABHS reproduction rate was found as 3% in 324 cultures cultivated in pleural fluid (8). Parapneumonic effusion and empyema are often seen in spring and winter months. Males are more affected by this condition than females. Although many pediatric patients were healthy previously, pediatric patients having underlying cerebral palsy, hypogammaglobulinaemia, chronic granulomatous diseases, Down syndrome, congenital heart disease, prematurity, cystic fibrosis, predisposing diseases such as tuberculosis and esophageal stricture were also reported (9). In the anamnesis of the patient, acute pharyngitis table ended 20 days ago was stated; ASO positivity was also a proof that she had GABHS infection. In addition, immunoglobulin and other primary immunological evaluations were also normal. Parapneumonic effusion or the clinical course of empyema, causative organisms (aerob/anaerob), pus amount in pleural cavity, previous antibiotic treatment varied from medical condition of the patient. Most commonly seen symptom in patients with empyema is persistent fever and other popular findings are weakness, loss of appetite, mild non-productive cough, pleuritic chest pain, mild dyspnea and loss of weight (10). The patient with empyema has a toxic appearance. Empyema should be taken into consideration when pneumonia has a septic course or existing symptoms exacerbate. Antibiotic treatment can make clinical table less apparent and the differentiation of pneumonia and empyema can become difficult. Most encountered symptoms are short-interrupted breathing (82%), fever (81%), cough (70%) and chest pain (67%). All these symptoms are also seen in pneumonia. From time to time patients can show indications with severe breathing difficulty and sepsis findings involving hypotension (11). The patient brought to our emergency service by ambulance was found out to have had fever, cough, side pain, weakness and loss of appetite complaints for 10 days; a pharyngitis table ended approximately three weeks ago and was brought to our service after she had developed breathing difficulties and hypotension table. The patient with quite high leukocyte, CRP, erythrocyte sedimentation rate was also determined to have high ASO value when there was a Streptoccus pyones reproduction in pleural fluid culture. Despite all diagnosis techniques, the presence of parapneumonic effusion and empyema and their distinctions (necessary for treatment) can be accurately disclosed by thoracentesis. 30-50 cc pleural fluid obtained by 18-19 G needles is examined in terms of macroscopic, microscopic, biochemical and microbiological parameters. If there is a clinical suspicion; tuberculosis, fungi culture and staining are performed. Purulent fluid is diagnostic for empyema. Cloudy fluid must be centrifuged to identify if the reason for cloudiness is due to leucocytes or lipids. After centrifuge, transparent fluid leucocytes are suggestive of cloudy fluid lipids. If pleural fluid is transparent in the first thoracentesis; the distinction of exudate or transudate should be carried out. Thoracentesis material of the case was dirty grey-green, and had a viscous consistent. Massive leukocytes were seen in microscopy and diplococcus that makes gram-positive chain was noticed but not acid fast bacilli and tuberculosis culture concluded as negative. Sputum and throat culture taken simultaneously resulted in as negative. Sputum and throat cultures turned out as negative were linked with the effect of empiric antibiotic that was used prior to hospitalization. Although the treatment of parapneumonic empyema of children is similar to that of adults’, treatment implementations of children are still contradictive. Numerous studies have defended that operative interventions are rarely necessary, on the other hand, some have suggested the benefits of early decortication in selected cases (12-15). Its specific treatment should be planned according to the phase of the disease at the time of diagnosis, the degree of lung pressure and overall condition of the patient. However, tube thoracostomy should be the first treatment in parapneumonic empyema of childhood despite everything because it has been determined that success rate was at 80-90% with only tube thoracostomy (15). Antibiotic selection must be conducted with regard to patient’s culture outcome and/or his/her age and most likely microorganisms for predisposing situations. Despite closed underwater tube thoracostomy and antibiotic treatment eligible for antibiogram, fibrinolytic agent from thoracostomy tube was applied to our case whose hypotensive and dyspneic table did not retreat. An important situation that drew our attention here was that empyema table caused by Streptoccus pyones progressed quite severely and led to pleural cohesions and therefore, we had to apply streptokinase for five times. Streptococcus pyogenes is one of the rare agents of empyema. It can give rise to complications such as severe clinical table and pleural cohesion. In the treatment, multidisciplinary approach is crucial as well as appropriate duration and antibiotic dose initially. Informed Consent: We received indormed consent from the patient. Peer-review: External and internal peer-reviewed. Surgical and Medical Practices: Y.B., B.E., Concept: Y.B., Design: Y.B., Data Collection or Processing: Y.T., Analysis or Interpretation: S.T., Literature Search: S.T., Y.B., Writing: Y.B. Conflict of Interest: No conflict of interest was declared by the authors. Financial Disclosure: The authors declared that this study received no financial support. Wheeler JG, Jacobs RF. Pleural effusions and empyema. In: Feigin RD, Cherry JD, Demmler-Harrison GJ, Kaplan SL, eds. Textbook of Pediatric Infectious Diseases, 6th ed. Philadelphia: Saunders Elsevier, 2009: 325-35. Cameron RJ. Management of complicated parapneumonic effusions and thoracic empyema. Intern Med J 2002; 32: 408-14. Mocelin HT, Fischer GB. Epidemiology, presentation and treatment of pleural effusion. Paediatr Respir Rev 2002; 3: 292-7. Gerber MA. Group A streptococci. In: Behrman RE, Kliegman RM, Jenson HB. Nelson Textbook of Pediatrics,17th Edition. 2008: 870-3. Celayir AC, İnalhan M, Etker Ş, İnan S. Çocuklarda infeksiyona sekonder plevral efüzyonlara yaklaşım:6 yıllık deneyim. Cerrahpaşa Tıp dergisi Ekim-Aralık 2000; 31: 191-5. Ertuğrul M, Somer A, Törün SH, Salman N, Gürler N, Salman T, ve ark. Çocuklarda Plevral Ampiyem: Seksen Beş Vakanın Değerlendirilmesi. Çocuk Dergisi 2013; 13: 16-28. Sakran W, Ababseh Z, Miron D, Koren A. Thoracic empyema in children: Clinical presentation, microbiology analysis and therapeutic options. J Infect Chemother 2014; 20: 262-5. Chen K, Chen H, Lin J, Tseng Y, Kuo S, Huang P, et al. Acute thoracic empyema: Clinical characteristics and outcome analysis of video-assisted thoracoscopic surgery. J Formos Med Assoc 2014; 113: 210-8. Burgos J, Falco V, Pahissa A. The increasing incidence of empyema. Curr Opin Pulm Med 2013: 19: 350-6. Walker W, Wheeler R, Legg J. Update on the causes, investigation and man-agement of empyema in childhood. Arch Dis Child 2011; 96: 482-8. Balfour-Lynn IM, Abrahamson E, Cohen G, Hartley J, King S, Parikh D, et al. BTS guidelines for the management of pleural infection in children. Thorax 2005; 60(Suppl 1): 11-21. Jaffe A, Balfour-Lynn IM. Management of empyema in children. Pediatr Pulmonol 2005; 40: 148-56. Islam S, Calkins CM, Goldin AB, Chen C, Downard CD, Huang EY, et al., APSA Outcomes and Clinical Trials Committee, 2011e2012. The diagnosis and management of empyema in children: a comprehensive review from the APSA Outcomes and Clinical Trials Committee. J Pediatr Surg 2012; 47: 2101-10. St Peter SD, Tsao K, Splide TL, Keckler SJ, Harrison C, Jackson MA, et al. Thoracoscopic decortication vs tube thoracostomy withfibrinolysis for em-pyema in children, 2009 thoracoscopic decortication vs tube thoracostomy withfibrinolysis for empyema in children: a prospective, randomized trial. J Pediatr Surg 2009; 44: 106-11. All rights reserved. 2018 © Galenos Publishing House.